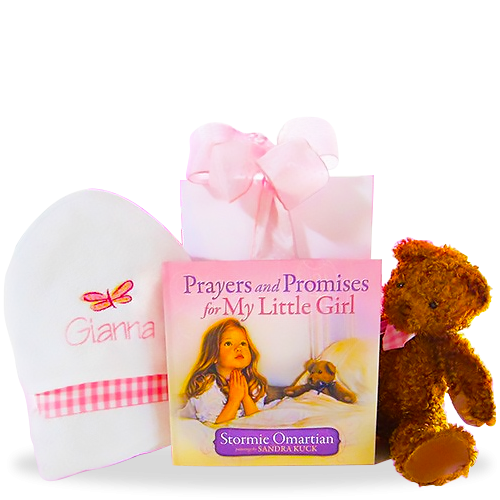 At the center of this giftbox is a beautiful book for your new baby girl called, "Prayers and Promises for My Little Girl." 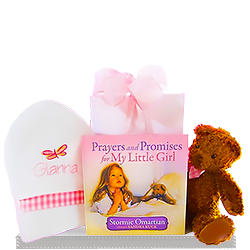 This large, hardback book is sure to become a keepsake for the parents and a favorite bedtime book for the little princess. 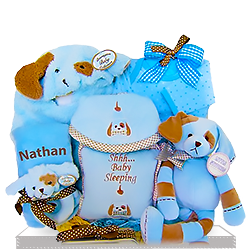 Included also is a 12 inch cuddly bear with a pink ribbon and an embroidered hooded bath towel. Choose up to 30 characters to personalize it! Definitely a thoughtful delivery at a joyous time. Our client called and was thrilled with it. She noted that the presentation was beautiful. 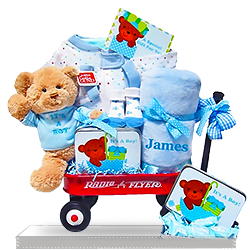 So on her word, we would definitely order from giftbaskets4baby again. The best gift ever. They told me everything was beautiful & high quality!!! Ordering online was quick and easy. Timely delivery in crucial time. Never ordered such gifts before. Bought this for my newborn niece. The parcel came on time and everybody loved it.